The ‘new school building’ was opened twenty years ago on Tuesday 30th September 1994. While few in the school now knew the old building with it collection of huts, leaking roofs and poor facilities, those who did are still proud of the building we are fortunate to work in today. The Mod – Several pupils did very well at the local Mod in Poolewe recently. Head Boy Innis Taylor was presented at school assembly with his trophy for achieving the Highest Overall Marks in the Fluent Oral competitions. Well done to Innis and the rest of the participants. We are aware that a number of pupils are competing in the National Mod (Inverness) this year. This is the largest group of pupils participating from Gairloch High in a good many years. We hope to be able to report of their success in a future issue. Scottish Chamber Orchestra Masterworks 2014 – S3-S5 Music pupils recently had a unique opportunity to take part in a project with the Scottish Chamber Orchestra. Paul Rissman, a Scottish composer and educator, chose to work with our pupils on a piece by the Swedish composer Karin Rehnqvist called “Arktis, Arktis!” This piece was inspired by the composer’s participation in an Arctic expedition, and her music describes breaking through the ice and also the bleakness & beauty of the landscape. The orchestra provided us with teaching materials, as well as a workshop for all the Highland Music teachers taking part, and a visit to the school by 2 members of the orchestra – a double bass player and a trumpeter. Everything culminated in a visit, on October 2nd, to Eden Court Theatre to see the orchestra perform the piece. Paul Rissman talked us through the important features of the music, and then the whole piece was performed in the second half. Karin Rehnqvist came all the way from Sweden for this event, and she contributed to the discussions about her music. Miss Hunter met and talked with the composer at the interval, and she was extremely positive about Scotland, and was very interested in our Comenius project; pupils and staff travel to Finland in December, and will visit the Arctic Circle as part of the programme. Events such as this are invaluable in supplementing the pupils’ musical lives. Our grateful thanks go to the SCO’s Connect Team, who gave us this fantastic opportunity. Duke of Edinburgh’s Award – Deborah Connop (S5) was awarded with her Silver certificate and badge at assembly recently. Well-done Deborah! Ross-shire School Seashore Art and Poetry Competition – Nadia Fenton (S1) was awarded with 1st Prize in a competition that took place before the summer. Nadia entered the competition when she was still at Shieldaig Primary. Congratulations to Nadia who was presented with her certificate along with a gift voucher at school assembly. Several other pupils from Poolewe and Shieldaig Primaries won prizes or were highly commended in the competition. S4 Work Experience – In the week beginning 6th October all of our S4 pupils were out on Work Experience. Some of the pupils work locally with builders, shops, primary schools and nursery, local estates… but several head off to the cities across Scotland and may even venture across the border. We are very grateful for the support of every employer who helps us give the pupils this valuable opportunity. In school we thank Mrs Flora MacKenzie and Mr Milner. Without their hard work this week would not happen. Jeans for Genes – On Friday 3rd October the pupils paid money to wear their jeans. Jeans for Genes is a charity that aims to improve the lives of children with genetic disorders, care for their families and invest in research. Pupils (and staff) had the opportunity to wear their jeans to school in return for a contribution towards this worthwhile cause. A total of £184.96 was raised. Blythswood Shoebox Appeal – Please support the pupils and help them fill shoe boxes for Blythswood. Pupils have been issued with leaflets and shoe boxes should be brought to school in the week we return to school. Golf Competition – On Wednesday 24th September thirty-two pupils from across all year groups took part in an inter-house golf competition. The event was organised by Ian Graham at Gairloch Golf Club and the schools Active Schools Coordinator, Martin Godwin. With the sun shining and two in-service days to follow directly after the afternoon of golf, all the pupils enjoyed a competitive but fun and friendly afternoon. It was great to see pupils who have never played golf before taking part and embracing the event, as well as seeing the more accomplished golfers playing some difficult strokes. In the end Tollaidh House was the winner of the event earning 15 house points, Kerry was awarded 10 points and Maree 5 points. The individual winner on the day was Joe Smith who scored an impressive 31 strokes around 9 holes and takes the individual trophy for the third year running! Well done to Joe and everyone who took part in this event. Our thanks go to Martin Godwin, Active Schools Coordinator, and members of the Golf Club (particularly Ian Graham) for helping arrange this tournament. Important Dates – Here are a few upcoming events. Please contact the school if you are in any doubt. More dates are also available here on the school website. 27th October – INSET day – staff only. 28th October – Pupils return to school. 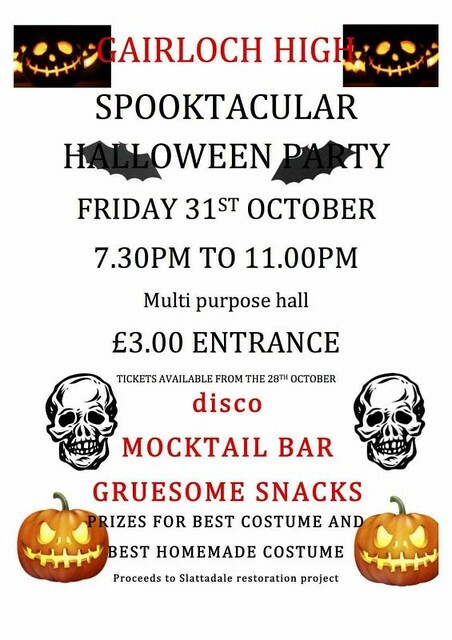 31st October – Halloween Dress Day and evening Party. Kindness Certificate – Mr Hulme has been promoting kindness in the school recently. Daily quotes have been read out at registration for staff and teachers to contemplate at the start of each school day. Mr Hulme reports that this is just the beginning! As a result of our interest in promoting kindness the school has been presented with a certificate by Kindness UK. Kindness Day in the UK is November the 13th this year! Comenius Trip to Turkey – On Saturday 22nd September our fifth Comenius visit of the current project began. Miss Hunter, accompanied by Mr & Mrs Port, set off with 5 pupils to visit a school in Turkey. 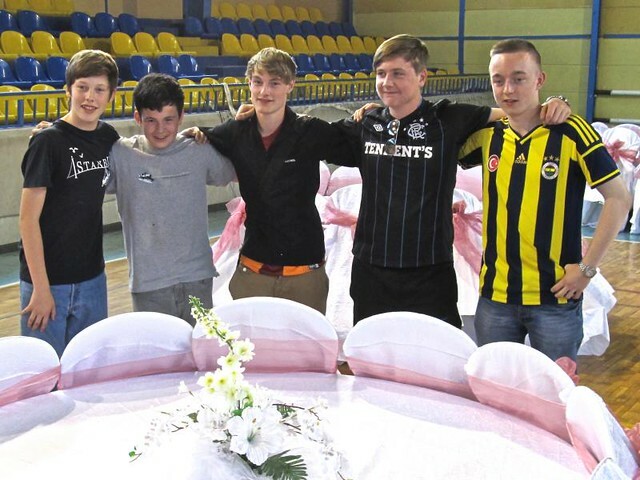 Calum Nelson, Callum MacKenzie, Matthew MacLean, Gregor Vickerstaff and Cameron Tallach met up with the Turkish pupils that they have been in communication with during the project. A group of staff and teachers from eight countries met enjoying a range of cultural activities culminating in a final ceremony of music, dance and food. The school that we visited is in the town of Akyazi in district of Sakarya around 160km east of Istanbul. We arrived on the Sunday and crossed into Asia via the enormous Bospherus Bridge. Later in the week we had a tour of the shoreline under the bridge, exploring both the coast of Asia and Europe. An extraordinary amount of work goes into arranging each of these trips and the boys made their thanks known to Miss Hunter on their return to Gairloch. Her efforts were much appreciated and the boys had the trip of a lifetime experiencing living with Turkish families and making friends from each of 7 other countries. They went shopping in the Grand Bazaar of Istanbul. The boys also visited Hagia Sophia, one of the most iconic and longest lasting structures in Europe, managing in its time to represent both Christianity as a church and Islam as a mosque. We also visited a museum commemorating an earthquake in 1999 that affected the region around the school killing thousands of people. The boys experienced various traditional Turkish dishes during the week. In the historical town of Beypazari they visited a silver bazaar along the Silk Road between Istanbul and Baghdad and were entertained by an effusive tour guide who didn’t speak a word of English! Later in the year we plan to hold an evening presentation for the community to share our experiences of Comenius. Watch out for your invitation! The group would also like to make known our thanks to Mr Andrew Bowker and Mrs Ann Fraser for helping with transport to and from Inverness train station. Another group of pupils will head off to Finland in December followed by a different group to Spain in February. The last event of the project will see representatives from each of the schools in Greece, Spain, Latvia, Finland, Poland, Portugal and Turkey arriving in Gairloch next April. So expect a ceilidh at the very least! Slattadale Restoration Fundraising – A very great thank you to everyone who has responded to our appeal for funds so far. Recently Mr Milner has been encouraging you to donate online. The page on JustGiving.com totalled £1250 by the deadline. We also received donations to the school not recorded on the website. We are constantly surprised and gratified by the support that we receive from the community. It is much appreciated and encourages us to develop extra projects that we believe will help the pupils. Concussion as a result of sports injury – Concussion is a brain injury caused by direct or indirect force to the head. It results in a variety of non-specific signs and/or symptoms and most often does not involve loss of consciousness. Most people recover in a few days but recovery can take longer for children and young people. You can find information on the school website here made available by the Scottish Government and fully supported by the official football and rugby organisations. The message with regard to children is be aware and if in doubt get the children to sit out of the game. Always seek medical advice if you are uncertain. Blythswood Shoe Box Appeal – Over 1.7 Million boxes have been donated and distributed through the years and this is the 21st anniversary of the Appeal. Gairloch High School pupils and parents continue to support this annual event. It’s very easy to put some basic items together. Things we take for granted can often be luxuries for people living in desperate poverty. Boxes will go to Albania, Bulgaria, Hungary, Kosovo, Moldova, Pakistan, Romania and Serbia this year. For Christmas delivery your shoebox should be at the school by the end of October. Leaflets have been distributed to pupils already. You can get more details of what to do on the Internet – just click here for Blythswood Shoebox Appeal 2014. By filling a shoebox you can share the true meaning of Christmas. This is just one of the projects S6 prefects are tasked with supporting. They organise a range of fundraising charity events throughout the year involving all pupils. Important Dates – Here are a few upcoming events. Please contact the school if you are in any doubt. Dates are also available on the school website. 9th September – S3 Monitoring reports were issued to parents. 3rd October – S4 Monitoring reports issued to parents. Pupils involved in Local Mod in Poolewe. Jeans for Genes Day in school. 6th October – S4 pupils on Work Experience for 5 days. 10th October – School Closes for 2 weeks break.